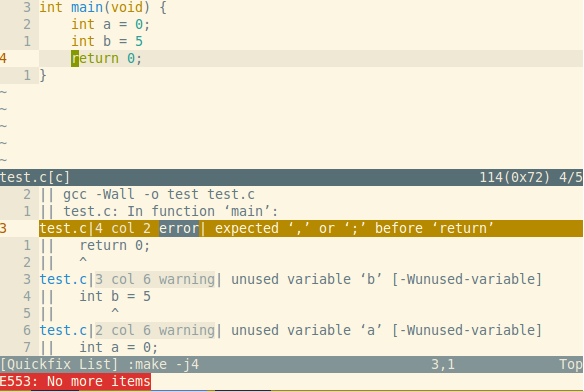 The Vim text editor provides built-in support for parsing compiler output. It has quite a broad understanding of the concept of a compiler though: You can call just any command and let the editor parse its output. For this to work correctly, format strings need to be specified, matching the expected format of compiler warnings and errors. This article is meant as a challenge for you, the reader. Does that sound interesting? Read on! In the first part of the article, we will see how to compile a simple C program via Vim – which is kind of a standard use case. After that we will use the same approach for something that you wouldn’t normally consider a compiler. Finally, in the last part it’s your job to create a custom errorformat expression that enables Vim to parse the output of our custom ‘compiler’ introduced before. To get started, let’s take a look at a gcc-based workflow. We will see how to call the compiler through the editor and get the interpreted output into our quickfix list. This enables the corresponding plugin, which in turn sets the errorformat option so it contains patterns for parsing the gcc compiler output. Now here comes the interesting part: The parsed output of the compiler run will be fed into the quickfix list automatically. We can verify that by opening up the quickfix window via :copen, as shown in the screenshot below. As you can see, there are three lines in the quickfix window that show the error and warnings generated by gcc. The error is highlighted – matching the cursor position (line 4) in the upper window. You can now jump to the remaining warnings using the :cnext command. As stated in the introduction above, Vim’s make command is agnostic towards the actual command it is supposed to call. That’s why we might use it for totally different tasks – text processing for example. As an exercise, we will create a script query_match.py that can find all occurrences of a particular pattern inside of a text file and output a row/column pair for each match. That looks pretty good so far. Unfortunately though, the editor is not yet able to parse the output of the query_match script. If we open up the quickfix list, we will see the original output, but without any mapping to the actual line and column numbers. That’s where the errorformat option comes in. We need to create a pattern that matches the output format of query_match.py. It probably will take some trials until we get the pattern right. This is a very basic example of course, so it won’t be too hard. The example script simulates a database query that takes about ten seconds. In this case, or if the input file were some gigabytes in size, we will need a little trick to keep the edit-test cycle short: the cfile command. It tells Vim to read a text file and parse it as if it was the output of a command called via :make. Now the quickfix list is populated – and we can repeat that until we find an errorformat setting that fulfills our needs. I will leave this as an exercise for you. A solution will published together with the next blog article. Feel free to send me a message if you have any comments or ideas! You can find the demo project at github. It contains everything you need to reproduce the example from this article. Vim has a very good internal help system. You can get information on any option or command by entering help <option> on the command line.